Once a garage door is installed we are able to offer an aftercare service that will ensure the door functions as it did when it was first fitted. Most garage doors require servicing annually to ensure the ‘safe and reliable’ cover provided by the manufacturer is maintained. These manufacturers require the door to be serviced by an approved engineer at least once a year and a maintenance record is competed and produced upon a warranty claim. As part of our after sales support we can provide a comprehensive service that extends our own installation warranty and also maintains the manufacturer’s ‘safe and reliable’ warranty. 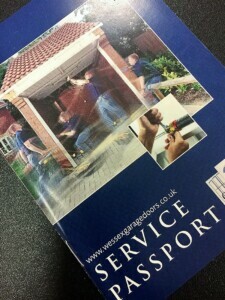 If you’ve had a new garage door installed by us and want to become a member of the Service Passport scheme we can offer the annual service at a reduced rate. Should you wish to join please contact our Service Department by telephone or email us on customerservice@wessexgaragedoors.co.uk.